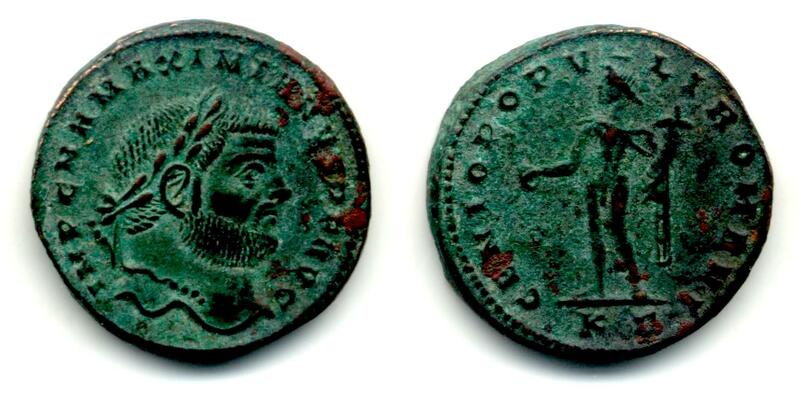 Minted at the third officina (G) in Cyzicus (Balkiz, Turkey) in 295 or 296 A.D.
Sutherland, C.H.V., "Roman Imperial Coinage", Volume 6 (RIC), Cyzicus, p580, nr 10b. hinterlassenen Sammlung und Aufzeichnung des Herrn Paul Gerin" (Voetter-Gerin), Kyzikos, Maximianus Herculius, p133, nr 12. Sear, D.R., "Roman Coins and their Values" (RCV 4th Revised Edition), p309, nr. 3631, variety from Cyzicus mint.